The TomTom ONE XL includes maps of the UK and Ireland and features 4.3-inch wide high-quality touchscreen makes navigating even easier. The TomTom ONE XL also has a pre-installed database of speed camera locations in the UK. TomTom ONE XL has been discontinued. Accessories, spares and parts are still available for your ONE XL. The TomTom ONE XL is preinstalled with maps of the UK and Ireland and the database of satety cameras is fully integrated in your TomTom ONE XL navigation software and alerts to warn you when there is a fixed safety camera on your route. The postcode navigation provides quick, accurate destination selection from full UK postcodes. TomTom ONE XL combines ease of use, portability, door-to-door planning and touchscreen technology, features car speed linked volume: volume of voice instructions will increase/decrease depending on speed of car and 3D and 2D graphics for perfect viewing day and night. The TomTom ONE XL is also easy to take from car to car. There is a large choice of route options and to make your trip complete, thousands of points of interest pre-installed for on the way such as hotels, restaurants, petrol stations, museums etc. The TomTom ONE XL is ready for TomTom PLUS services that include real time information on traffic congestions, weather conditions and extra downloads such as detailed city maps, scenic routes, additional voices, points of interest and much more. (Subscription and mobile phone with Bluetooth and GPRS needed). Ready out of the box: Just plug in the TomTom ONE XL, switch on and go. Easy to take from car to car. TomTom ONE XL works with Tele Atlas Maps to provide detailed maps of the UK. Which in addition to street information include features such as route calculation, Points of Interest, Estimated Time of Arrival, and more. Looking for genuine accessories and spares for the TomTom ONE XL? 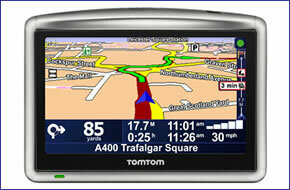 All parts are genuine TomTom product and specifically designed for use with the ONE XL sat nav. Accessories available to purchase include car charger and USB mains charger. Do you have a question about the TomTom ONE XL? Submit your question via our contact page.